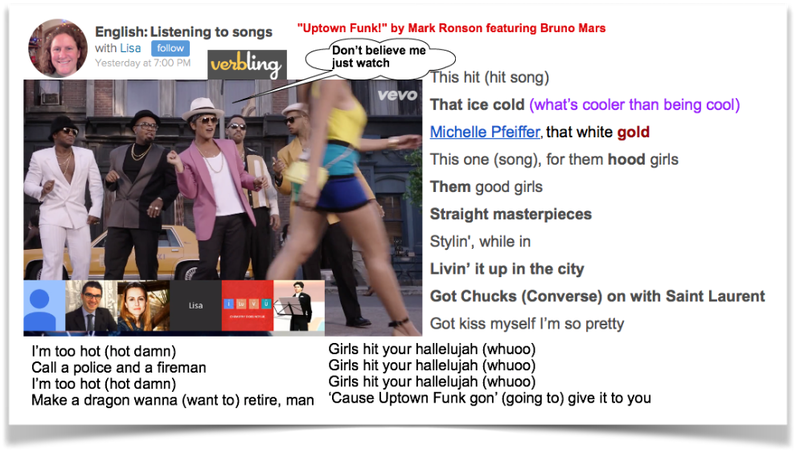 "Don't believe me just watch" is the slogan from the song "Uptown funk" which we studied in the Lisa's class in online verbling.com school. Understanding lyrics in foreign language would be difficult. It would be much harder for genre of songs which represent list of subcultural movings. Funk style of music belongs to this list. Let's try to understand the ideas which this song provides. Uptown is a part of town away from central commercial district. This song dedicated to small area where people can enjoy their life, the singer uses phrasal verb "living it up" and makes a statements "I'm too hot" or "Got kiss myself". Ice cold is the upgraded level of cool.Michelle Pfeiffer has white skin and golden hair, hence “white gold.” In other words this song is a HIT! And all girls are masterpieces. Maybe on a Saturday the singer will be at the “spot” — another name for a bar, club, etc. And girls being there don't believe him, just watch. Thanks our teacher, Lisa, we were able to understand difficult lyrics of the song and a specific subculture of some social groups became more understandable. Even funk music is not my cup of tea, I enjoyed watching this video clip. My advice for you: don't believe me just watch !